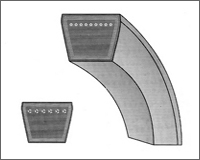 Wedge Belts have been the result of continuous thrust by the manufacturers and the users on higher power transmissions with reduction in space requirements. Wedge belts can transmit high power to extent of 1.5 to 2 times the classical belts with same top width this has been achieved by the dimensional changes, part from better cord constructions used and the optimum placing of the cord line which provides the best support to the cord while in motion. For efficient performance of wedge drives it is essential that the proper tension be maintained in the drives, failure to maintain the same will render the purpose of wedge belts ineffctive. Less deformation of the belt cross section when in contact with the pulleys ensures better contact between the beltflanks and the pulley grooves. 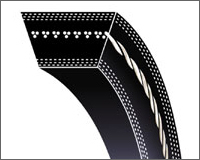 Wedge belts are used primarily on all the new drives because of the space savings achieved by using these belts. Wedge belts find its extensive use in all industrial applications from light duty drives to heavily loaded drives. 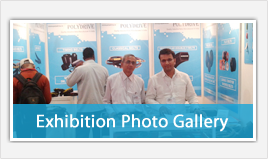 Polydrive manufactures the entire range of wedge belts. The nominal length designation for wedge belts is the pitch length in mm. Are built for maximum tension control, drive uniformity & long life, with minimum heat build-up & stretching on low horse power electric motors & gasoline engines. They are designed for high speed drive & short center distance. Specially compounded base for good flex fatigue resistance. Polychoroprene rubberised poly cotton jacketing fabric. HMLS polyester cord gives low stretch & better flexibility. Oil & Heat resistant, Antistatic.